There aren't many wearables that track your activity and heart rate all-day-long, while fitting in everywhere from the office, gym, yoga studio and dinner. I'm Becca Caddy and I'm here to explain why I love the Fitbit Alta HR and just how seamlessly it can fit into anyone's routine. 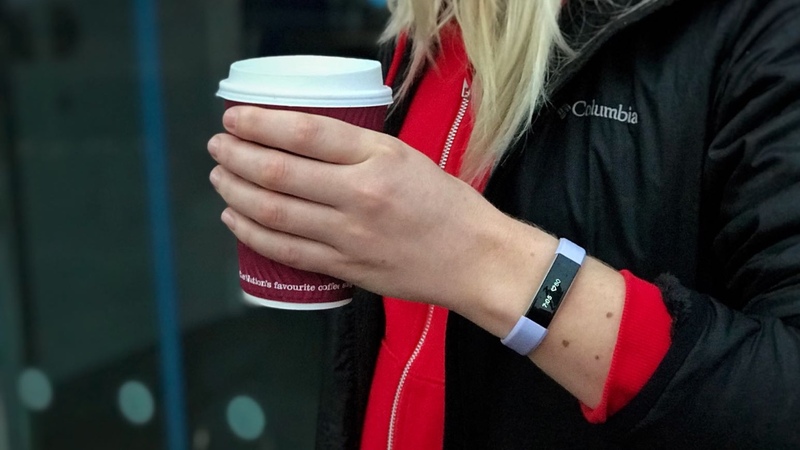 Here's a diary of a standard day in my life – and how the Fitbit Alta HR's varied features and versatile style makes it easy to hit my fitness goals. The Fitbit Alta HR's silent alarm wakes me up at 7.30am. I absolutely hate waking up, and this is such a good way to greet the day, with a gentle vibration on my arm rather than the loud screech of my alarm. I made sure it was set the night before using the Fitbit app, then simply tapped it to turn it off after I'd woken up. I'm really trying to be mindful of getting the right amount of sleep, so the next thing I do is check the Fitbit app to take a good look at my sleep stats. Not only do I find out I had a good night's sleep, I also dig into the quality of my sleep because I'm a sucker for lots of colourful data. With the Fitbit Alta HR this is really easy-to-see, because Fitbit's Sleep Stages technology shows me exactly how long I spent awake, in deep sleep, in light sleep and in REM sleep with the help of a handy graph. Last night wasn't a bad effort – but shy of the recommended eight hours. I'll try to hit the hay a little earlier tonight, I promise. I also take a look at what my Resting Heart Rate (RHR) is, which the Alta HR tells me thanks to its PurePulse Heart Rate tracking technology. I like to check that because it tends to be a really good indicator of how healthy I am generally, as well as how I'm feeling. Sometimes, if my resting heart rate is higher than usual, it's an indicator of being a bit stressed and run down. I'd usually take that as a sign to make some time to rest ASAP, but luckily my ticker is resting where it usually is. Once I'm up and ready to go to work, I decide which smart band I want to add to my Fitbit Alta HR today. There are so many options, but I like the lavender soft leather for sleeping in because it's really comfortable. But today I'm swapping it out for the fuchsia pink classic band to add a splash of colour to my outfit for a day of meetings. I'm on my way into work when I get an app challenge notification. I see that my Wareable colleague Julie has overtaken me in our steps challenge. I'm not having that – today is going to be a big one. I walk into the office to up my step count for the day. Fingers crossed I'll be able to catch up! After a few hours of writing, I head out to a coffee meeting with a fellow journalist to talk about a new project. I make sure I leave the office a bit earlier. I used to try and get those steps in to hit my goal, but these days I'm more about upping my intensity, and getting my heart rate elevated. That's tracked by the Alta HR, and it's better for me than just a normal amble. The meeting is only a 15 minute walk away, but I make it brisk and take the stairs to the fourth floor to get my calorie burn up. I have another meeting in the afternoon and keep a close eye on how many calories I'm burning up too. A few more walks like that and I might be able to justify a slice of cake this afternoon. When I get there I put my phone away, but I'm waiting for a call from a colleague I really need to answer about a feature I've written. I make sure that call and text notifications are on my Fitbit Alta HR, which means when I get a call I'll see a little notification on the screen. That feels more polite than getting my phone out - not to mention it's less loud and disturbing! Now it's back to the office where I have a lot of writing to do. Time quickly runs away with me and I've still not clocked up enough steps throughout the day. Argh! Luckily, my Alta HR notifies me if I've been still for too long and prompts me to get up and try and hit a 250 step target - challenge accepted! I walk to my final meeting of the day rather than getting the bus and check my Fitbit app on the way in, I've clocked up 8975 steps, but perhaps more importantly, 54 active minutes. Good going! I head home at the end of the day and as soon as I get in I change into my yoga clothes and grab my mat to go for a quick class with a group of friends. Luckily I can walk there in under 15 minutes and bag even more active minutes. I like to track my heart rate throughout the yoga session and see how it moves in and out of the Fat Burn heart rate zone, then drops down low towards the end when we do a quick meditation, and shoots back up again when we wrap up. I drop my yoga mat off at home and get ready to go to dinner with my boyfriend. It's a good time to switch my Fitbit Alta HR band to the silver bracelet too, which adds a touch of glamour to my outfit and looks more like a stylish piece of jewellery rather than a gadget. I walk to dinner – I'm killing it today – and as I get there the Fitbit Alta HR notifies me I've done it, goal met! You get a little celebration on the display, which I have to say is always a pick-me-up. Who doesn't like hitting a goal? I check in the app and I'm back at the top of the challenge for the day. I've also hit my daily active minutes for the day too and all my stats are green. I order a dessert after dinner to celebrate! After dinner, I head home and get into bed – and I might just make that eight hours tonight. I switch back to the lavender band for extra comfort and check how many steps I've achieved today: 13,609 and 62 active minutes. I'm very happy with that. You might notice that I was so close to hitting my calorie target, but just missed out. That's fine, I'll make up for it tomorrow: that's what tracking health with the Fitbit Alta HR is all about – insightful stats that help you make healthier decisions.